Taking a cue from the Marvel Universe, researchers report that they have developed a self-healing polymeric material with an eye toward electronics and soft robotics that can repair themselves. 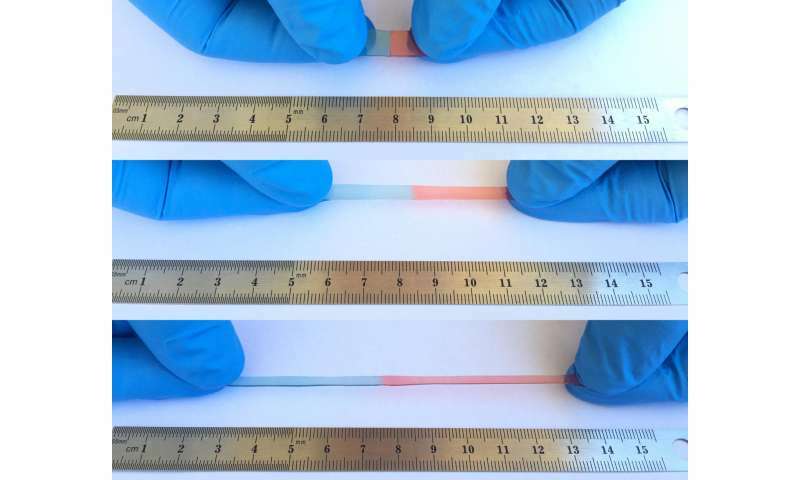 The material is stretchable and transparent, conducts ions to generate current and could one day help your broken smartphone go back together again. "When I was young, my idol was Wolverine from the X-Men," Chao Wang, Ph.D., says. "He could save the world, but only because he could heal himself. A self-healing material, when carved into two parts, can go back together like nothing has happened, just like our human skin. I've been researching making a self-healing lithium ion battery, so when you drop your cell phone, it could fix itself and last much longer." The key to self-repair is in the chemical bonding. Two types of bonds exist in materials, Wang explains. There are covalent bonds, which are strong and don't readily reform once broken; and noncovalent bonds, which are weaker and more dynamic. For example, the hydrogen bonds that connect water molecules to one another are non-covalent, breaking and reforming constantly to give rise to the fluid properties of water. "Most self-healing polymers form hydrogen bonds or metal-ligand coordination, but these aren't suitable for ionic conductors," Wang says. Wang's team at the University of California, Riverside, turned instead to a different type of non-covalent bond called an ion-dipole interaction, a force between charged ions and polar molecules. "Ion-dipole interactions have never been used for designing a self-healing polymer, but it turns out that they're particularly suitable for ionic conductors," Wang says. The key design idea in the development of the material was to use a polar, stretchable polymer, poly(vinylidene fluoride-co-hexafluoropropylene), plus a mobile, ionic salt. The polymer chains are linked to each other by ion-dipole interactions between the polar groups in the polymer and the ionic salt. As a test, the researchers generated an "artificial muscle" by placing a non-conductive membrane between two layers of the ionic conductor. The new material responded to electrical signals, bringing motion to these artificial muscles, so named because biological muscles similarly move in response to electrical signals (though Wang's materials are not intended for medical applications). For the next step, the researchers are working on altering the polymer to improve the material's properties. For example, they are testing the material in harsh conditions, such as high humidity. "Previous self-healing polymers haven't worked well in high humidity, Wang says. "Water gets in there and messes things up. It can change the mechanical properties. We are currently tweaking the covalent bonds within the polymer itself to get these materials ready for real-world applications." More information: Mechanically adaptive electronic polymers for transparent self-healing artificial muscle, the 253rd National Meeting & Exposition of the American Chemical Society (ACS), 2017.